In 2079, in Washington, the ex-CIA Operative Snow is brutally interrogated, accused of treason against the United States. The chief of the secret service Scott Langral believes that he shot the agent Frank in a hotel room. Meanwhile, the idealistic daughter of the president of the USA, Emilie Warnock, is visiting MS One, a maximum security prison in outer space expecting to find evidences that the prisoners are actually guinea pigs of a huge corporation. When one of her bodyguards loses a hidden pistol to the dangerous prisoner Hydell, he subdues the staff in the central control room and releases the prisoners, including his brother Alex who becomes the leader of the riot. Now the veteran agent Harry Shaw offers freedom to Snow if he succeeds in rescuing the president’s daughter. But the idealistic Emilie does not want to leave MS-One without the hostages. That’ll freeze the nerves in this spot for 24 hours. Don’t expect a cinematic masterpiece when watching this movie, but expect it to be an entertaining empty-headed action sci-fi with Guy Pearce as a purebred John McClane, in an ultra-modern prison in space, who must save the president’s daughter. A clichéd kind of Musketeers story with the slogan “One for all, all for one” replaced by “One against all”. A well-known and popular story with the hero fighting against a whole horde of scum, just about 500 murderers and rapists who awoke from an artificial nap, and helping a comely damsel in distress. You can safely call it “Die Hard In Space“. The story itself isn’t really special and feels rather incoherent. Don’t be discouraged by the terrible chase scene at the beginning of the film. That looked terribly outdated and it seemed like it came straight out some kind of C64 game. Some parts are fairly unlikely (including the wind tunnel and the disguise trick of presidential daughter which gave me a “Yeah sure” feeling) and the predictability level is immense high. But besides that, the action-part can be considered very satisfactory and particularly the characters are interesting enough to turn it into an entertaining movie to fill up the evening. Guy “The Rover” Pearce enjoys himself here as the quite burly muscular bundle “Snow”, who behaves in a rather fatalistic way and pulls every now and then a dry one-liner or sarcastic remark out of his hat, what provides for some chuckle moments. Once again the comparison with the young Bruce Willis is made quickly. The conversations between him and Maggie Grace (as Emilie Warnock) are highly entertaining at times. But especially the two criminal brothers Alex (Vincent Regan) and Hydell (Joseph Gilgun) steal the show (a kind of “Jekyll and Hyde” interpretation). Two extremely dangerous criminals with Alex as a born leader. But especially Gilgun is brilliant at times as the total crazy Hydell with a heavy English accent. He looks quite terrifying and spoils the plans of his brother over and over again (a stupid decision which Alex makes again and again). 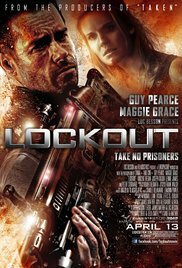 Besides the imaginative design of a space prison where dangerous criminals are piled up (literally) to serve their sentence while being in a coma, a whole bunch of hilarious one liners and action scenes filled with crazy prisoners, in the end this is just a third-rate simple action movie with a linear storyline. A film that fits in our consumer society. Consume, digest and forget. My favorite part is the beginning of the film where a punch and a crooked cigarette are the attributes. Once again it immediately reminded me of a similar scene from “The Last Boy Scout“. I assume that Bruce has done it all before.